As you read this I will be in the air on my way to Africa as leader of a team of 14 folks representing 9 different U.S. churches in 6 different states. Regardless of the different hometowns, denominations, backgrounds, experiences and ages represented on this team, we are united in purpose. Everyone of these team members has a deep desire to care for the orphan and to be used by God in a way that will give him honor and praise. What a privilege to lead such a group of people! We will be visiting 2 World Orphans projects in Ethiopia and 3 projects in Kenya where the team will get to see how new projects are developed and how existing projects are functioning. The team will serve alongside the local African churches as we do medical outreach (HIV/Aids testing), sports outreach (presenting the gospel to children through sports), and home care ministry (part of the continuum of orphan prevention or delay). A respected friend and church leader stated to me that his church had always been reluctant to engage in orphan ministry because the size of the problem was just too overwhelming. I responded by asking him if the size of the problem gave The Church the right to do nothing? Yes, the shear numbers are daunting and it is a God sized task to address the "Mega Issue" of 143,000,000 orphans world wide. If we ask ourselves, "Why did God allow this enormous problem and how might He use it to strengthen His Church? ", we begin to see it from a different perspective. Perhaps we should view it, not as a problem, but instead an opportunity.....in fact, I think it is the single best opportunity for The Church in our lifetime! I believe that The Church is at it's best when it's actions demonstrate the will of God. Actions that demonstrate Christ's love in a tangible observable way draw attention to The Church and to it's Motivator, Jesus Christ. The Church is called to be the hands and feet of Christ. When we obey, Christ is glorified and He blesses our obedience. The Church has the opportunity to grow stronger in Christ, in obedience, and in faith. So with that said, please consider this. 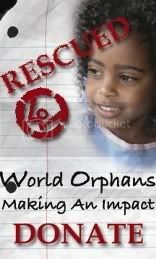 There are 143,000,000 orphans concentrated in many of the least reached countries in the world. What if God sees them as an army? An army waiting to be trained, commissioned and mobilized. An army of next generation missionaries capable of finishing the "Great Commission" task. They already speak the indigenous language and they already understand the culture. In other words, the church does not have to send or place them...God already has them strategically positioned. If we, The Church, rescue the orphan and give them the love, hope, and promise of Jesus Christ, they will carry it forward more effectively than any time in modern church history. I believe that The Church needs the orphan as much as the orphan needs The Church!